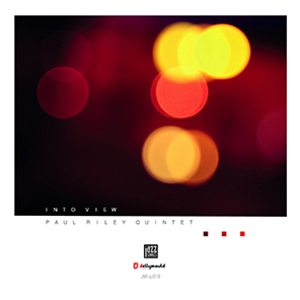 A DEBUT RELEASE that has magnetised my attention over the past few weeks, young London-based saxophonist and composer Paul Riley’s quintet album, Into View, possesses a certain blue-sky luminosity which seems to combine the spirit of West Coast jazz with a cool, precise, English sensibility. Riley’s companions on this recording are already familiar names on the circuit – Ant Law (guitar), Mitch Jones (piano), Matt Ridley (double bass), Dave Hamblett (drums) – and together they forge a compelling set of eleven original numbers which sparkle equally to tightly-scored and broadly-improvised episodes. Riley and Law solo upfront, as well as frequently sharing extended, rapid-fire unison lines, within a musical landscape which might suggest a blend of early Moutin Reunion Quartet, Kairos 4tet and John McLaughlin – yet this new band already demonstrates the potential to flourish under its own identity, due to Riley’s compositional strength and instrumental steadfastness. Opening outlines the quintet’s clear, measured articulation before launching into the energetic, controlled propulsion of Spindrift which flows melodically to bustling solos from Riley, Law and Mitch Jones; and, following, the elegance of title track Into View is conveyed through Paul Riley’s smooth, dry, Getzian alto, buoyed by an infectious piano/bass/drum riff. Song for Laura subtly charms with a relaxed, fluent, soprano sax demeanour reminiscent of Tim Garland’s work; and Outlaw is a stand-out, its rippling groove showcasing Ant Law’s remarkable invention and dexterity through an attractive Santana/McLaughlin tone – the whole thing just flies! Wistful and carefree, Another Summer relaxes to the delicacy of sustained sax and bass solos, whilst sprightly Underhand perpetuates the cloudless feel-good as Riley’s grittier alto pushes the envelope a little higher (a sign, perhaps, of greater freedoms to come). Brisk waltz Gamelas possesses a searching soprano melody and aura worthy of TV drama titles, Jones’ decorative piano chromatics especially impressive here; and the more shadowy aspect of Riley’s writing continues with the more introverted Looking Back. Ahead of Closing (a reflective tailpiece), The Way Home darts to more of those audaciously-extended, shared unison or harmonised lines from Riley and Law – and whilst there may be some sense of repetition of earlier material, it nonetheless tumbles over itself in unbridled enthusiasm. Released on 6 April 2015, Into View is a fine and promising debut, displaying a fervour which is difficult to ignore. Available from Jellymould Jazz.